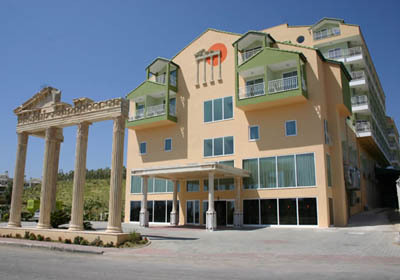 Situated directly on the beach in Colakli. 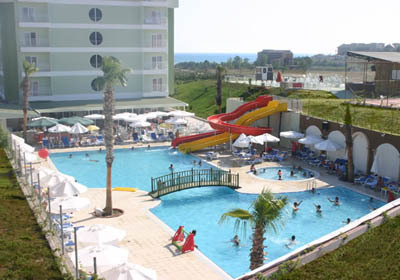 Side is 5 km, Manavgat 12 km, Antalya airport 55 km away. Reception * lobby * restaurant with terrace * bars * conference room * outdoor swimming pool * kids pool * water slide * indoor pool. 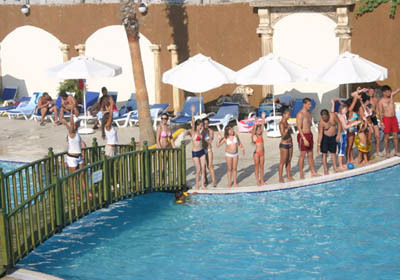 Turkish bath * sauna* fitness * tennis court* volleyball * table tennis * boccia * darts * shuffleboard * aerobic * surf (licence required) * disco. Massage, billiards, water sports, videogames, tennis floodlight. 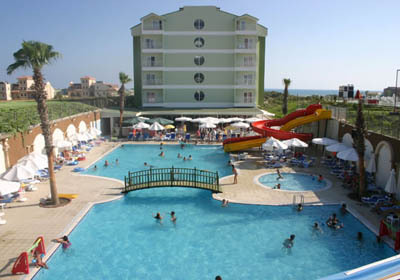 Air-conditioning (split) * balcony * minibar * satellite TV * bathroom with hairdryer * telephone * carpet * safety box. Open buffet breakfast, lunch & dinner. In the afternoon snack, coffee/cake, late breakfast, midnight snack.